Going Digital: A holistic approach to policymaking in the digital age | The Forum Network, hosted by the OECD: Shape ideas. Shape policy. Shape the Future. Economies, governments and societies across the globe are going digital. About half of the world’s population is now connected to the Internet, up from 4% in 1995. In many countries, digital transformation is now characterised by almost universal connectivity, but also by ubiquitous computing, and draws on the generation and use of vast amounts of data. Technologies continue to develop rapidly and are combining in novel and innovative ways, pushing digital transformation in new and often unpredictable directions. Together, governments and stakeholders must shape a common digital future that makes the most of the immense opportunities that digital transformation holds to improve people's lives and boost economic growth for countries at all levels of development, while ensuring that nobody is left behind. Digital transformation affects many aspects of the economy and society in complex and interrelated ways, challenging existing policies in many areas. As a result, silos are disintegrating, and hard borders are becoming less relevant. This means that stronger co-operation and collaboration are critical, as well as a re-think about how policy is developed and implemented. In particular, a flexible, forward-looking and integrated policy framework that cuts across policy silos is essential to ensuring a coherent and whole-of-government approach to fully realise the potential of digital transformation and address its challenges. Under the auspices of the OECD's Going Digital project, the OECD is developing such an integrated policy framework. It includes seven building blocks – Access, Use, Innovation, Trust, Jobs, Society and Market Openness – that are supported by quantitative indicators and practical policy guidance. Not only do governments need an integrated policy response to digital transformation, they must also seize the opportunity to go digital themselves. Governments – at the local, regional and national levels – can use digital technologies to improve efficiency and targeting, enable innovative policy design and rigorous impact evaluation, and expand citizen and stakeholder engagement. Many governments and administrations are currently exploring the possibilities, testing the potential, and evaluating the effectiveness of using digital technologies for improving policy design, implementation, and enforcement. In a new series of digital country reviews, the OECD has zoomed in on Sweden, a country that has seized the opportunity for digital transformation after observing that it has been the main driver of economic growth in recent years. 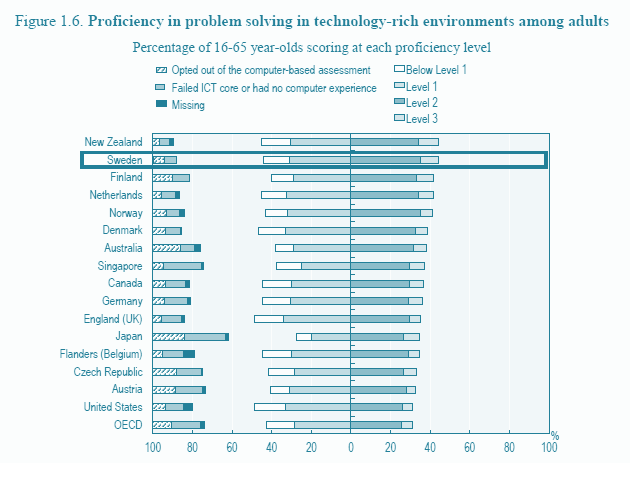 Sweden is amongst the top performers in ICT-related problem solving and between 2006 and 2013, the ICT sector and ICT investments together accounted for more than 40 percent of labour productivity growth. Hence, the government has drafted plans to foster these skills as the labour market becomes increasingly digital. In 2017, the government issued a national cyber security strategy, which according to the OECD, marked a turning point toward a more holistic approach to digital security in the country. The government vision of this initiative was to protect the lives and health of the population, the functioning of society, and its capacity to uphold fundamental values such as democracy, the rule of law and human rights and freedoms. Sweden has been making strides in a number of policy areas to maximize the benefits of digitalization and moreover has dedicated itself to ensure that policy measures are inclusive to the entirety of its population. For instance, the government has emphasized that education plays an important role in enabling children to actively participate in an increasingly digital life and world of work. It aims to ensure that everyone, regardless of gender, social background, functional capacity or age, will be able to develop his or her digital skills and participate in an equal manner in society. Further, it has empowered immigrants to be included in the success of this transformation by pledging to allocate EUR 1.1 million in 2018 and 2019 to immigrants with an engineering background. "Going Digital in Sweden." , OECD, June 2018, www.oecd.org/fr/science/oecd-reviews-of-digital-transformation-going-digital-in-sweden-9789264302259-en.htm . A national cyber security strategy." , Government of Sweden, July 2017, www.government.se/information-material/2017/07/a-national-cyber-security-strategy/.